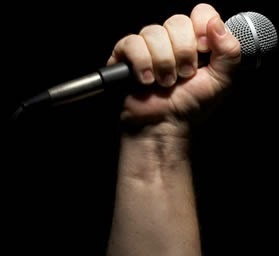 An informal form of poetry, Slam has its origins in Beat and Negritude poetry forms, commonly with a stylized nod to Hip-Hop. It caught on in urban areas throughout the nineties. “Slam poetry is really beautiful word vomit,” Jarrett Crnkovich (‘14) said, who competed and participated in slam poetry while at Mount Michael. “Slams” events which allow youth to gather for the purpose of slam poetry, allow aspiring poets to meet other teens they might not cross paths with regularly. Transcending the boundaries of strong socioeconomic differences is for many, quite a learning experience. This is also a common motif through highly political pieces, which provide not only an outlet for creative minds, but a voice for those not typically given the microphone. For students at Mount Michael, the opportunity to try out Slam Poetry will be available this year. In coalition with the Nebraska Writers Collective, students at the Mount will prepare by writing and practicing poetry in hopes of competing at the Louder than a Bomb festival in March. The coach, provided by the Nebraska Writers Collective, is still unknown at this time. For the meantime, Gina Fosco, the computer science and journalism adviser, has been the go-to for contacting the Nebraska Writers collective. Despite her already full schedule, Fosco feels a commitment because she also was involved with Omaha Poetry scene from 2004 to 2006. She was often an audience at poetry nights until she eventually tried her hand at writing poetry. Slam Poetry at Mount Michael has only been available for four years, the same time that Louder than a Bomb has been in Omaha. The original festival started in Chicago in 2001. Bringing Louder than a Bomb was a interest for Mason as director of the Nebraska Writer’s Collective. A big part of funding comes from individual donors, as well as an optional entry fee from schools. This is kept optional because Mason’s goal is to have Louder than a Bomb available for everyone to participate, particularly those normally unable to. “Nebraska is a great place for poetry as there is an amazing amount of talent here and more opportunities for writers every year,” Mason said. Ted Kooser, a Nebraskan poet chosen as Poet Laureate, is just one example of the talent found in Nebraska. Mason himself writes poetry. One collection “Things We Don’t Know We Don’t Know” won the Nebraska Book Award for Poetry.